Twitter is a social networking platform used to follow people, share interests, participate in conversations and find out what’s happening in the world right at this moment. And there are more than 255 million active users sending 500 million tweets per day! Anyone can read, write and share messages of up to 140 characters, which are available to the whole Twitter community and can also be found in search engines. Twitter is a great opportunity to build brand awareness, generate leads, encourage “social signals” of your content, network as well as monitor your online reputation and what is being said about your brand. But, unless you’re Ashton Kutcher or Oprah, you’ll need to hustle to build your fan base. So how do you grow your Twitter following fast? Introducing Tweepi … an awesome little tool that allows you to follow the followers of Twitter accounts where your customers are already hanging out. You can get started using Tweepi for free, but I highly recommend paying the small monthly fee and go Platinum which will allow you to follow 200 people at a time making the process easier and quicker. Before you get started, make sure your Twitter profile is complete and looking fabulous. You only have a few seconds to make an impression, so update your avatar, write an engaging bio and make sure your profile is consistent with your brand. Now head on over to Tweepi. 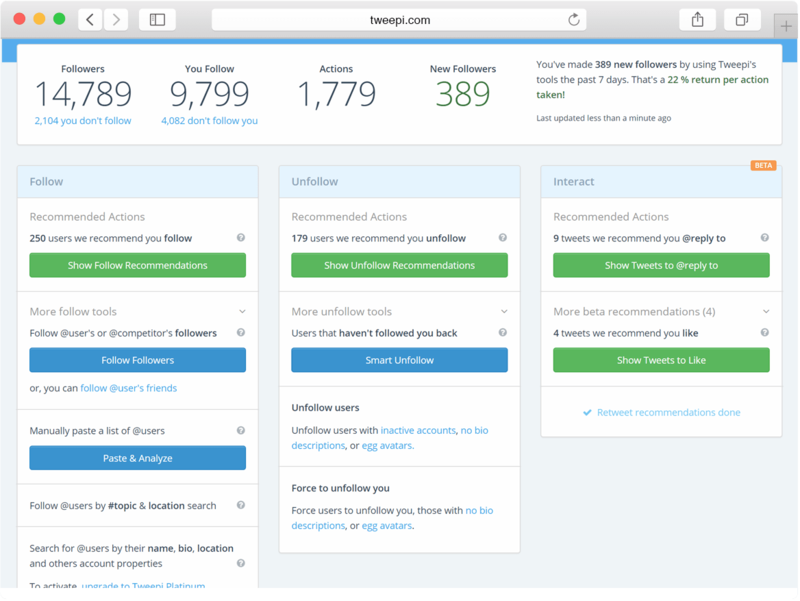 With their easy-to-use dashboard, identify the Twitter accounts that your ideal customers follow. These accounts could be your competitors (a little cheeky, but totally awesome), business groups and organisations, thought leaders, authors, podcasters, show hosts and other types of influencers. Using Tweepi’s tools, follow these accounts ON MASS. Do this everyday. Don’t stress, it will only take you a few minutes! The idea is 2-4 per cent will follow you back. Unfollowing those who don’t follow you back is key. Twitter has restrictions on how many people you can follow and you don’t want to get flagged for being a spammer. You can do this easily within Tweepi. The goal of this process is to grow your following and the reach of your content, but the process itself will also get you in front of potential customers. When a potential customer sees you followed them, they’ll check out your profile and website, which they can click through to learn more, sign up for your email list, and more. Remember, even if you have a massive following, you still need to delight and entertain them every step of the way. You can’t just tweet about your own projects, blog posts and thoughts. Share what you’re reading and what inspires you periodically using a tool like Buffer. When you share good content, you’ll find your tweets get more favourites, replies and retweets. This will naturally bring in new followers and each new follower brings the chance to sign on a new customer. It is not our abilities that show what we truly are… it is our choices.